Look at the map of Vietnam, the south is very flat and near the sea. The central is thin and narrow. The north Vietnam is big, mountainous and near the sea as well. The topography favours the north Vietnam with incredibly beautiful scenery. The north Vietnam is the gateway to another world of luscious landscapes and mysterious minority cultures. This is the reason to join Hanoi trip for amazing Vietnam holiday. + Halong Bay : Amazing, fascinating, stunning........ 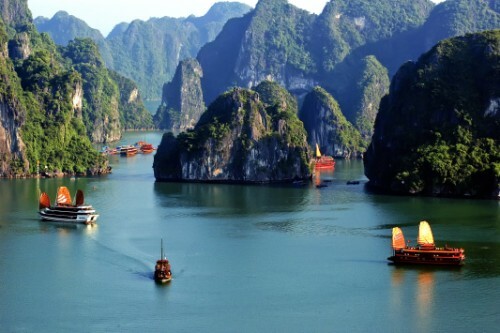 Words could not discribe the scenery of Halong Bay, twice recognized as the world's natural heritage by UNESCO. Halong with 1553 sq km and 3000 big, tiny islands rising from the emerald waters is One of 7 must-visit places on the earth. 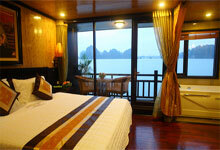 Halong bay tour in luxury travel style is the best of Vietnam luxury tours. This is enough to invite you to join Hanoi trip. + Mai Chau is home to a great diversity of ethnic minority people who do not pay attention to how rich they are, the most important is how to enjoy their life. The strong family relationship is the typical feature of the groups. Here you can visit most family with 3 or 4 generations living together . This is the second reason to join Hanoi trip. + Hanoi: Hanoi has already eaten many hight mountains of paper and sea of ink from famous poem writers, song composers just because of its charming beauty. Before leaving Hanoi city, most foriegners have the same feeling that their Hanoi trip should be longer. Surely, join Hanoi trip - best of Vietnam luxury tours for greatest moments in your life. 8:30 your Hanoi trip starts by visiting the Temple of Literature, Tran Quoc pagoda. Then, walk around peaceful, romantic Hoan Kiem lake. Then take a cycling tour around the French and old quarters. Visit Ho Chi Minh Mausoleum(close on Monday and Friday), his House on Stilts, the One Pillar Pagoda. Enjoy water puppet show. Great experience on Hanoi trip, the best of Vietnam luxury tours. 8:00 Say goodbye to the charming city and go to Halong Bay. Enjoy many chance to take beautiful photos along the way. On arrival, embark a luxury Halong bay cruise and enjoy Welcome drink. You are ready to discover Halong, the highlight of all Vietnam tours. Great Vietnamese lunch is served while the junk is cruising Halong Bay through many naturally sculpted limestone islands rising amazingly one after one from water. Halong's incredibly beautiful scenery and delicious food make you leave the world behide. 15:00 Experience a floating village, see daily life of local fishermem. Visit surprising cave, another great stop during Halong bay tour. 17:00 continue to cruise Halong bay to Loun cave. Swimming or relaxing on your Halong bay cruise and see the sunset( kayaking is optional). 18.30: Anchor in secluded lagoon for overnight. 19:30 enjoy delicous Vietnamese dinner. Today will mark the highlight of all Vietnam holiday packages and your lifetime travel. Mix yourself with nature under the sunrise over Halong Bay. 8:00 Start your Halong bay tour by Climbing 330 steps on the top for great photoes or swimming at Titop island. 9:00 Back to your Halong bay cruise. Freshen up and check out. 10:00 Enjoy buffet brunch while cruising through many limestone islands of different shapes. 11:00 Drive back to Hanoi. Now, you have had more experience why Hanoi trip is the best of Vietnam tours. Today your Hanoi trip starts at 8:30. Enjoy 2.5 hour drive through beautiful countryside. 12:00 have lunch. After lunch, visit Poom Cong, Lac, Chieng Chau villages where white Thai people live. Visit their stilt houses where 3 generations live together. You can talk to them through your guide, discover their daily life. Now, we think you will recommend Hanoi trip to your friends. After breakfast, continue to discover local market, peaceful and beautiful valley with very large rice paddy fields. The incredibly stunning scenery offers many photoes. 12:00 Drive back to see Giang Mo village of Muong minority group. It is time you look back the photoes of the Hanoi trip. Transfer to airport. Now, the Hanoi trip ends.